I love to snack and I love good food presentation so today’s video is all about both! Today I’m sharing an update to my most-loved DIY to date—my paper plate baskets. Because if you didn’t know you can make a basket using a paper plate you gotta know. It’s such a quick and easy DIY that you’re going to want to make these for every occasion. Paint fun patterns on the top side of uncoated paper plates. I used gouache paints I had on hand but you can use any type of paint, even a kid’s school watercolor set will do the job. Just paint as you please and allow the plates to dry completely before assembling them. Then watch the video below to see how to fold and assemble them! 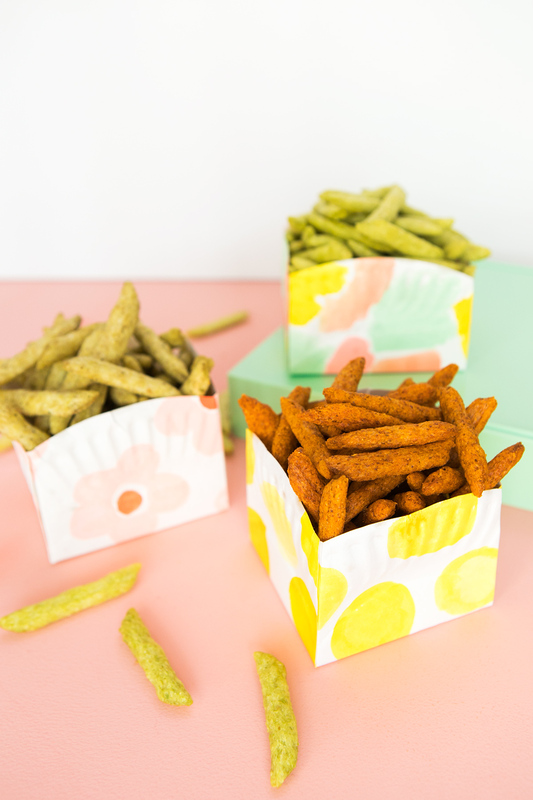 Fill with your favorite snacks—my choice is Harvest Snaps! Did you know you can make a basket using a paper plate?!? Sarah these are stinkin’ adorable! I love this idea for a picnic especially. And the patterns you painted are so cute! Just pinned! Can’t wait to try it out this summer. This is such a cute and simple idea! I’m always looking for fun ways to decorate kid-themed parties and this is perfect.